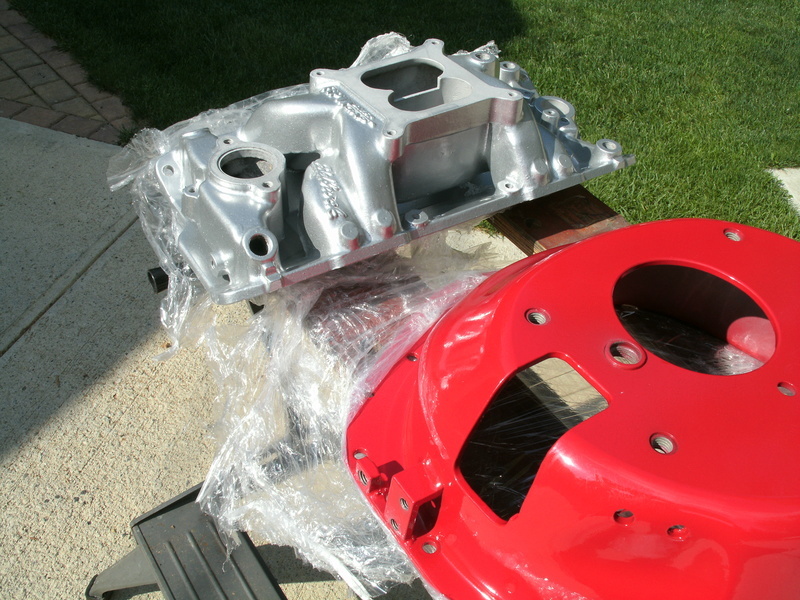 When I bought my 350 block it was already painted the really nice heat Chevy orange paint but I don't want that color and I don't want the paint in the lifter valley. Does anyone know a good paint stripper to clean out the lifter valley and the outside block? Re: Engine block paint stripper? Just stripper that's available at auto parts stores will work OK. Some have what's called "aircraft paint stripper" which is OK I haven't ever used it on my airplanes, so it's just BS for a selling point. So, what kind of paint was used in the lifter valley ?? 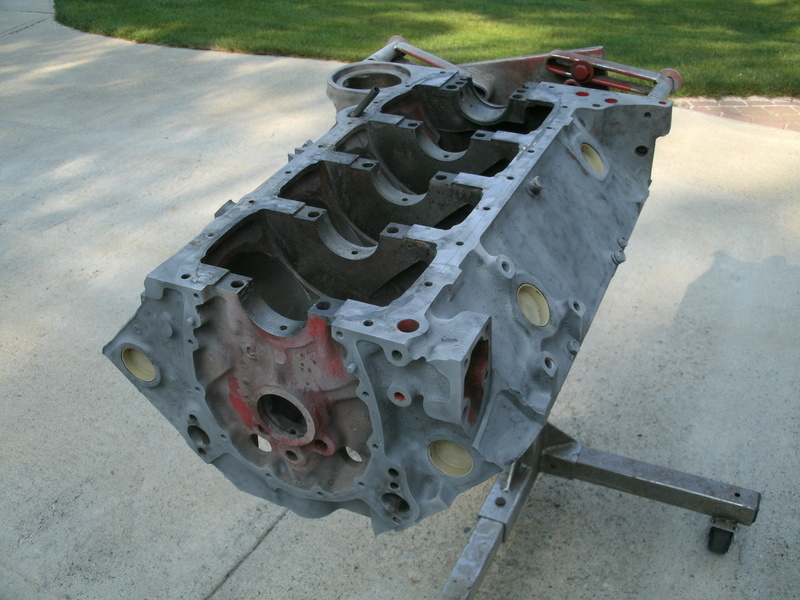 Some industrial engines used red-lead paint on the internal engine surfaces, but not many people use it on auto engines. Stripping paint in the lifter valley may not be a good idea, with the chance of getting the stuff down into the engine etc. Save yourself the trouble. Leave the paint alone if it is not flaking in the lifter valley. 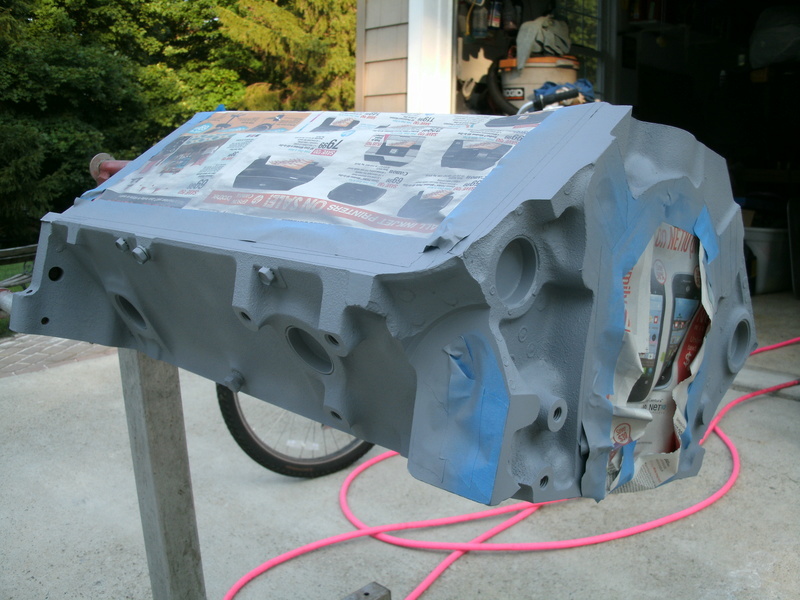 As far as the outside, wipe it down with lacquer thinner, fan it with gray engine primer and paint it. If your bringing the block to be hot tanked, most of the exterior paint should come off. As for the lifter valley, I've seen quite a few valleys painted with I think Glyptol? Some sort of stuff used in electric motors that real hard when dry. Supposed to make your oil return faster to the pan. I got mine back from hot tanking and then I taped it off and sandblasted it. Then high temp chevy orange red. All you need to do then is tape it off like Joe73's pics, then scuff the shiny off the current paint (don't need to go to bare metal, just make the paint on it look flat) with a wire brush or sandpaper as completely as you can. Then blow off the dust and prep the surface with thinner or something else that removes residual oil, wax, and grease. Then prime and paint. Sounds like a nice color scheme, good luck. 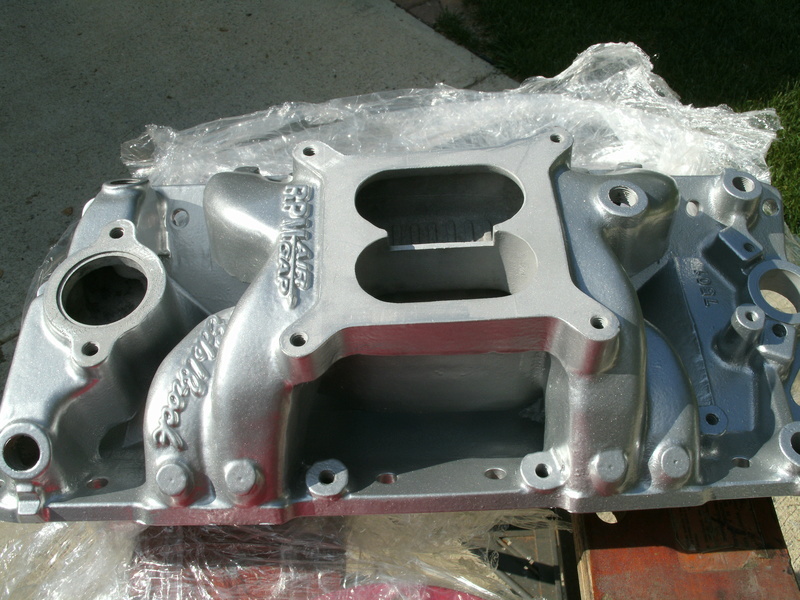 [quote="Joe73"]I got mine back from hot tanking and then I taped it off and sandblasted it. Then high temp chevy red orange. bigredlaguna wrote: All you need to do then is tape it off like Joe73's pics, then scuff the shiny off the current paint (don't need to go to bare metal, just make the paint on it look flat) with a wire brush or sandpaper as completely as you can. Then blow off the dust and prep the surface with thinner or something else that removes residual oil, wax, and grease. Then prime and paint. Thank you, I wanted to make it a random color sinse the hole car is dark grey and black a nice bright color in the engine bay would be cool!! Kevin. I first scrub the block down with lacquer thinner and wire brushes. Then I like to soak the block and lightly scrub with wax and grease remover. Install the freeze out plugs with some Indian Head (old school) sealant. Then I used spray cans taking my time to put it on a little wet. I didnt want any dry spray. 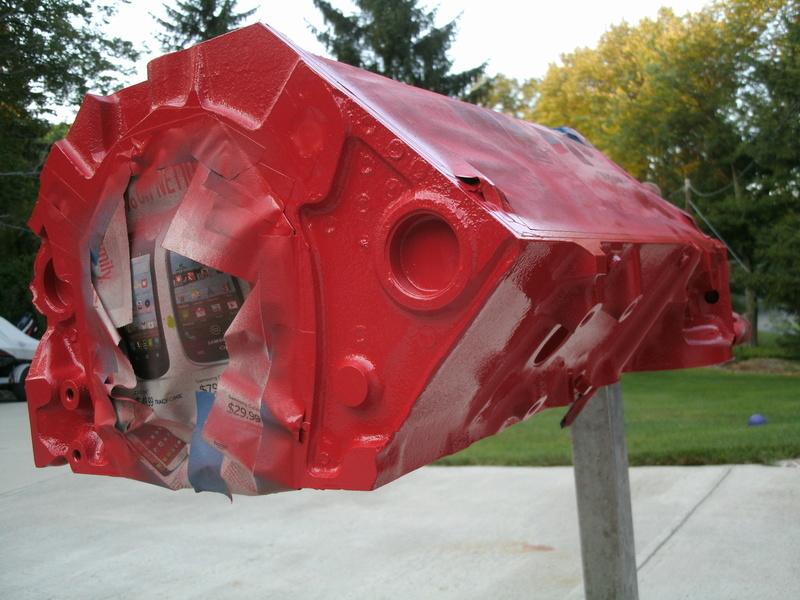 I used Dupli-color 1612 high temp primer just to cover, not heavy. Then I used Dupli-color 1607 Chevy Orange-Red. 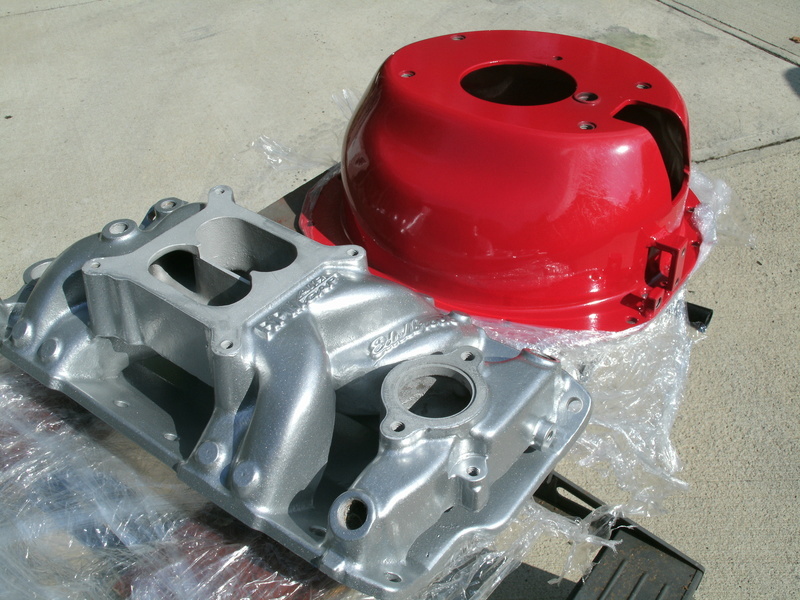 From the research I've done, that is the correct color for a small block in our years and prior. The big blocks had a slightly different color and I believe it was a Red-orange but I'm not sure about that. Lots of people have great results shooting regular basecoat on their engines. Guys say it holds up great. I thought of shooting epoxy primer because I use it on everything. But I've always had good results with Dupli-color high temp paint so I decided to stick with it. When I did the first full rebuild, the machine shop did the hot-tank to it. It came out of the tank, with the paint still on it, and even glossy yet. Those guys wanted to know what that paint was !! Anyway, it's still on there..! buy the aircraft paint stripper and use a power washer. Dont it hundreds of times. youll have to do it 3 or 4 times. The aerosol can is easier but the quart jug works better but a pain to brush on. read the directions. wear pants and long sleeves and for sure gloves and face protection, if it gets on you it burns alot. BlackChevelleSS wrote: buy the aircraft paint stripper and use a power washer. Dont it hundreds of times. youll have to do it 3 or 4 times. The aerosol can is easier but the quart jug works better but a pain to brush on. read the directions. wear pants and long sleeves and for sure gloves and face protection, if it gets on you it burns alot. Search engine painting on google. You can use your basecoat car paint on the engine without issues. Just do your normal good prep and shoot it any color you like. Dont worry about the high temp paints. Good prep and shoot it. That has been the consensus from all the reading I've done on it. Joe thanks for info on the Orange. Paint. Your photo shows the block primered. What primer did you use before applying the rattle can orange? Dupli-color 1612 high temp primer. 1607 orange red. I've also just gone good prep and gone straight to 1607 on other engines. No issues with peeling or anything. Also what do you guys think about painting the alumninum heads? What is the best way to prep and paint the aluminum? I wouldn't paint them. Keep the benefit of heat dissipation. bracketchev1221 wrote: I wouldn't paint them. Keep the benefit of heat dissipation. I agree !! Even though I'd love to clear coat them. LOL. I powdercoated my rpm air gap. I know it will hurt heat dissipation but I cant stand the look of a dirty aluminum manifold. I did my scattershield as well. I'll see how everything else comes out to see if I want to paint them.